Diplomat Blades introduces the 4020 Gator Grip GGT5 safety gloves from HexArmor USA designed for use in the oil and gas industry. Based on the Gator Grip Technology design platform, the safety gloves combine high performance materials engineered to provide industry-leading cut resistance and puncture protection with an extremely strong grip suitable for any oil situation. Gator Grip GGT5 safety gloves are made from SuperFabric material that offers superior cut resistance and puncture protection. The cut resistance exceeds ISEA and CE level 5 in noted areas. Puncture protection capability safeguards against wickers, burrs and cable wire. The superior grip of the cut-resistant safety gloves prevents formation of oil film and displaces oil allowing maximum contact with tools and other surfaces in saturated oil conditions. Safety features also include hi-visibility colour for easier signalling and compliance. The safety gloves offer impact protection on the back of the hand and fingers to reduce risk of contusion and crush. A key advantage of these cut protection gloves is that they can be laundered. 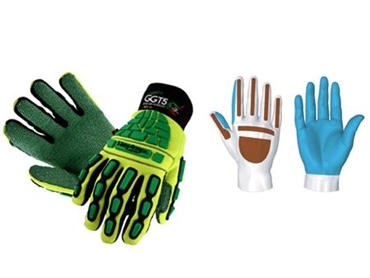 Gator Grip GGT5 safety gloves are typically recommended for use in light or heavy oil situations as well as oil and gas operations.